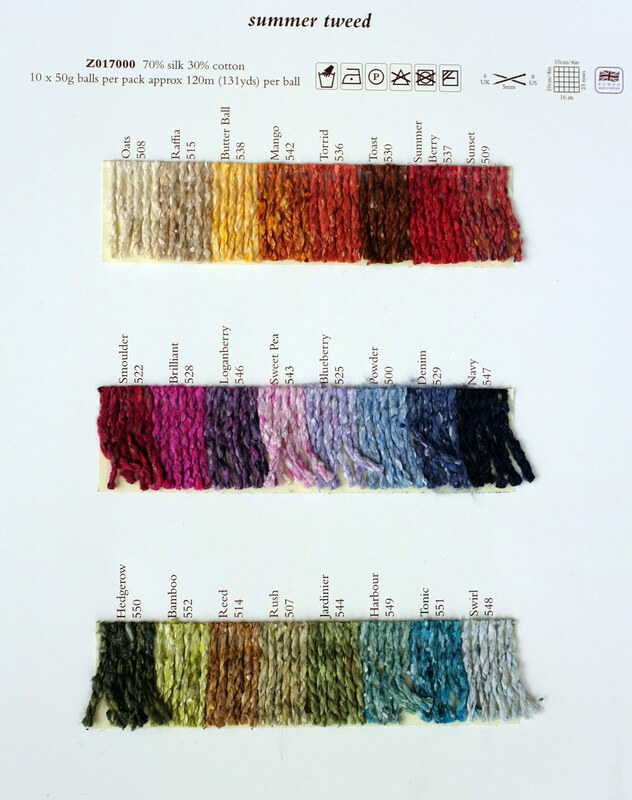 Yarn Type SALE 50% OFF! Combining the luxury of silk (70%) with the durability of cotton (30%), this is a perfect all year round yarn. (per ball) Approx. 108 metres (118 yards) per 50g hank. Hanks will change to balls when all stocks of hanks have run out. 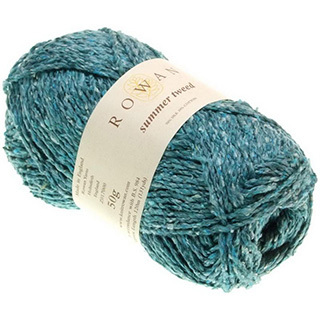 Summer Tweed balls - length 120m (131 yards). A collection of 16 handknit designs for Men and Women by Martin Storey for summer days using Creative Linen, Summer Tweed, and Savannah. Inspired by the rugged coast with its ever changing light. Simple to work styles feature together with crunchy cables, lace and fashionable geometric, fairisle patterning. This sleeveless summer top has been taken from our pattern archives. Originally featured in Magazine 31 and designed by Kim Hargreaves it is now available to download. This ladies jacket, with one button detail, has been taken from our pattern archives. Originally featured in Magazine 33 and designed by Kim Hargreaves it is now available to download. This belted, long line ladies cardigan has been taken from our pattern archives. Originally featured in Magazine 33 and designed by Kim Hargreaves is is now available to download. This ladies jumper has been taken from our pattern archives. Originally featured in the Summer Tweed collection and designed by Kim Hargreaves, it is now available to download. This simple vest has a deep v at the back and has been taken from our pattern archives. Originally featured in the Summer Tweed collection and designed by Kim Hargreaves it is now available to download. Part of the Rowan Studio 15 collection, this free pattern has been designed exclusively for the web site by Sarah Hatton and uses Summer Tweed. Knit this ladies, accessory long length, summer wrap from the Rowan archive. Designed by Kaffe Fassett using a glorious combination of Summer Tweed (cotton and silk) and Kidsilk Haze (super kid mohair and silk), this design was originally featured in Rowan Knitting & Crochet magazine 49. This oversized floor cushion has a rich, dusty pallette and has been designed exclusively for the web site, by Kaffe Fassett. This throw is relatively easy to knit and has been designed exclusively for the web site, by Kaffe Fassett. This geometric pattern in creamy tones has been designed by Kaffe Fassett. This geometric pattern in denim blues has been designed by Kaffe Fassett. These spot cushion have been designed by Kaffe Fassett, exclusively for the web site, using Summer Tweed. The stoney pallette of these patterns were inspired by marble floors in Venice and have been designed exclusively for the web site, by Kaffe Fassett.